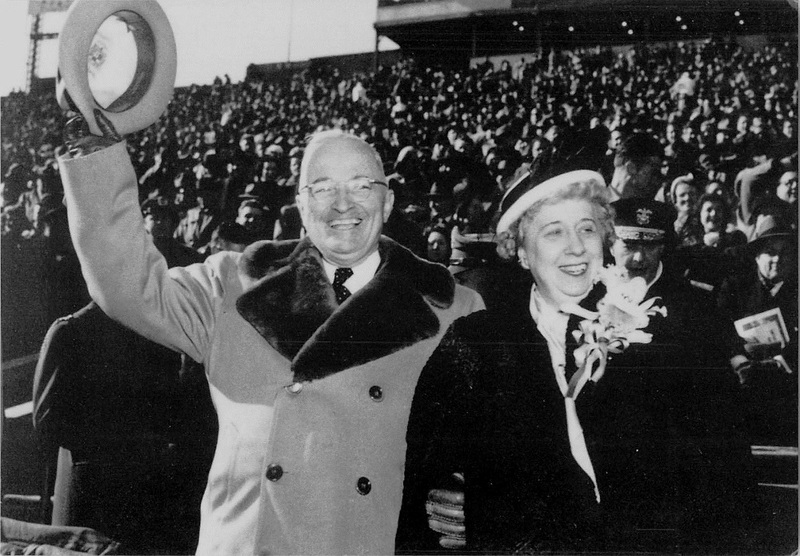 President Harry S. Truman and Bess Wallace Truman at the Philadelphia Municipal Stadium for the Army-Navy football game, November 27, 1948. Courtesy Harry S. Truman Presidential Library. When Red Smith attended the Army-Navy game in 1948, he—like most of the spectators—expected nothing more than a “pageant of youth,” complete with a cameo appearance by Harry Truman, fresh from his reelection three weeks earlier. 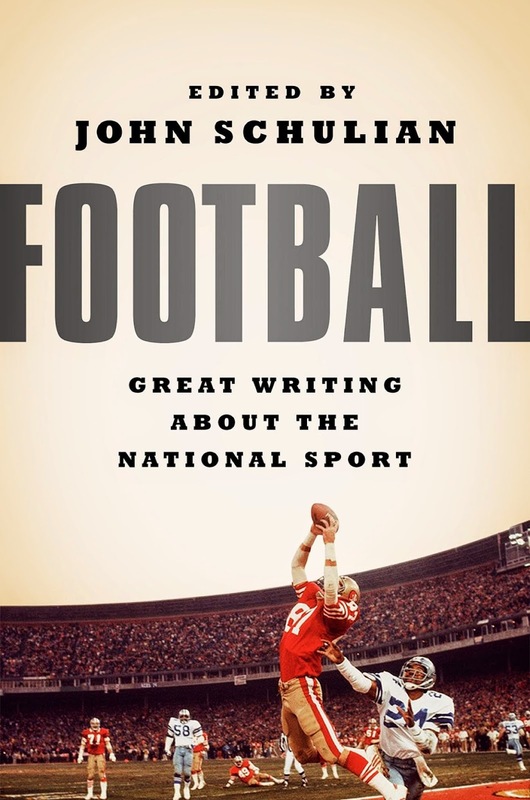 Many Americans had not expected Truman to win his race and, similarly, most of the crowd in the stadium didn’t expect an even match-up between the two football teams, much less the “exhibition of pure, unbridled fury” that actually occurred. Elegance is a rare word in any discussion of sportswriters and yet it is the first word that comes to mind when remembering Walter Wellesley “Red” Smith (1905–1982). One thinks back to his self-effacing graciousness, his Brooks Brothers sport coats, and, most of all, his crystalline prose. Reading Smith was like discovering that E. B. White knew what an onsides kick is. Notes: The Minneapolis line refer to the odds established weekly by the Athletic Publications Inc., established in Minneapolis by Leo Hirschfield in the 1930s and highly regarded by bookmakers and gamblers for three decades. “Gallup Picks Army” is a mocking allusion to the Gallup poll that confidently predicted Thomas Dewey would win the 1948 presidential election against Harry Truman. The sign reading “Send in Alan Ladd” refers to the Hollywood star, who briefly served stateside in the Army during World War II but was discharged for recurring stomach problems and influenza. In early 1947 he was cast in the title role of the much-publicized Paramount film Whispering Smith—Ladd’s first starring role both in a Western and in color. Based on a real-life Western detective and made popular by a best-selling novel and five previous movie adaptations, the character earned his name from his subdued demeanor and lightning-fast gun draw. After many production delays, the movie was released the week after the Army-Navy game. For this week’s selection, we depart from the usual format and reproduce Smith’s column, in its entirety, below. You may also download it as a PDF or view it in Google Docs. A slight, four-eyed man stood teetering on tiptoe down near the 40-yard line in Municipal Stadium, his pearl-gray hat bobbing like a floating cork as he craned and twisted and strained to see over the wall of blue Navy overcoats and white Navy caps whose owners towered in front of America’s Commander in Chief. Harry Truman, of Independence, Missouri, a former haberdasher and prominent fancier of hopeless causes, was struggling to focus his lenses on the hopeless Navy football team, a team that had lost thirteen successive games and now, with fifty-eight seconds of its season remaining, stood tied with undefeated Army, champion of the East, third-ranking power of the nation, and twenty-one-point favorite in the trustworthy Minneapolis line. Fifty Secret Service men fidgeted, watching protocol go down the drain. For safety’s sake, it has been their custom to get the President clear of the crowd two minutes before an Army-Navy game ends. Hot or cold, out he goes with two minutes to play. But Harry Truman wouldn’t budge. Like the 102,580 others present at the forty-ninth meeting of service academies, he simply had to see Navy fire the last shot in its locker. Pete Williams took a pitch-out and lost three yards. Bill Hawkins went twisting and wrestling through the line, gaining five. The clock showed thirty-three seconds left. Slats Baysinger, the quarterback, tried to sneak around end. He lost six. Navy huddled once more, rushed up to the line for one more play, but the referee stepped in, waving his arms. The red hand of the clock stood at zero, and the best, most exhilarating and least plausible Army-Navy game in at least twenty years was over. The score, 21 to 21, was the same as that of 1926, the year historians always mention first when they try to name the finest of all Army-Navy games. Then all the players save two departed, as civilians and non-combatant midshipmen and cadets swarmed over the field. Dave Bannerman, Navy’s substitute fullback, and Ted Carson, left end, just stayed there where the deed had been done. When small boys came asking for autographs, they signed abstractedly and kept rubbering around through the crowd. Maybe they were looking for a couple of peach cakes to share an evening’s liberty. But it seemed more likely they were waiting in the hope that someone would give them one more crack at Army. The great, sunswept crowd that paid six dollars a head hadn’t expected anything like this. The customers had come for the show, the spectacle, the pageant of youth that always is about as thrilling as anything in American sports. They had thought to get their money’s worth out of just being there; out of seeing the magnificent parade these kids always bring off superbly before the game; out of the shiver that scampers along the spine when the colors are brought to midfield and the band plays the national anthem and the packed stands are a frozen block of color, with the bright blue-gray of the Army on one side and the shimmering white of Navy caps on the other. They figured to get a chuckle out of the kids’ musty nonsense. And of course they did. There was a Navy dreadnought that rolled around the cinder track and shot off cannon and went down in flames. There was a huge papier mâché goat and a huge papier mâché mule. There were signs in the Navy stands: “Gallup Picks Army” (to which the Army stands replied with a cheer: “Gallup, Gallup, Gallup!”) and a sly reference to the difference between Army and Navy schedules: “When do you play Vassar?” (“Vassar, Vassar, Vassar!”) and then after the Navy scored first: “Send in Alan Ladd”; (no response to this). But nobody expected a ball game, except the few people who bore in mind an old, old truth which the game restated dramatically. That is, that there never can be between undergraduate football teams of the same league a gap in ability too great to be bridged by spirit alone. Navy proved that beyond remotest doubt, and the guy who did most to prove it was a fellow playing on spirit and very little else. Bill Hawkins, ill a long while this season with a blood disorder that doctors call acute infectious mononucleosis, was entirely out of action for three weeks in midseason. Without preparation, he came back to play against Michigan on November 6. Then he played three minutes against Columbia and was hurt November 13. Since then he hadn’t a minute of physical contact until today. But today he was a bull, and a mad bull into the bargain. He ran the ball fourteen times and made fifty important yards. He scored two touchdowns. He backed up the line, his blocking was like a crime of passion, and he played almost all afternoon. It wasn’t exactly a football game, it was an exhibition of pure, unbridled fury on both sides for both sides persistently moved the ball against incredibly savage resistance. It was, altogether, as good a thing as could possibly happen to football. Thirty-two Navy players got into the game, which means—if there is such a thing as justice—that the Navy added thirty-two full admirals today. For the guys down there on the field today were officer material, as ever was. It goes without saying that there are more than thirty-two full admirals in Philadelphia tonight. Originally appeared in the New York Herald Tribune (November 27, 1948) and reprinted in Out of the Red (1950). Copyright © 1950. Reprinted by permission of Terence Smith and Catherine O’Meara.